Admissions are done as per Doctor's advice. Emergency admissions are, by their very nature unpredictable and we have a 24x7 Emergency Department where the Emergency Medical Registrar assesses the patient condition and advice accordingly. In case admission is advised, necessary formalities are fulfilled at the Admission Counter on the ground floor. Medical history of any patient is very important for treatment. So you must carry all your previous investigation reports and medical prescriptions, details of regular medicines, if any. Please do not bring money or other valuables into the ward with you. Mobile phones are also not allowed with patients in Wards. It is the responsibility of patient relatives not to keep any such articles with the patient. Hospital Authority does not bear any responsibility for loss or damage of the same. For Indoor patients interim or advance deposits may be done at the Indoor Reception Counter functioning 24 hours. Clothing for the patients are provided from the hospital on admission. A resident medical officer is in immediate charge of the patients in ward. Your consultant will visit your patient during his regular ward rounds. The resident medical officers are in constant touch with the medical, surgical registrars and the treating consultants regarding the patient’s treatment. Please contact the Floor PRO’s or the PRO at the reception who will arrange so that you can talk to your treating consultants on a regular basis. In case you have any further medical query you can contact our Deputy Medical Director or Medical Director. 1:1 Nurse patient ratio is maintained in Critical Care and 1:5 in general ward. Extensive medical research is an ongoing process in the hospital and has monthly educational programs for our consultants, ,resident medical officers and nurses. Any information concerning your illness is strictly confidential. It will not be shared with anyone, except the clinical staff involved in your care. WARD - Morning: 10.30 AM to 11.30 AM & Evening: 5.00 P.M. to 7.00 P.M.
Two visitors (with visiting cards) are allowed at a time. Help us in providing you Quality Care, you should not allow your visitors to crowd or tire you during their visits. If you have particular difficulties with these visiting times you may speak to the Manager Front Office or Nursing Superintendant . Children should be supervised at all times during visits. Greeting card, Light reading material, crosswords and small games are ideal gifts as they help pass the time. Hospital policy strongly discourages patients and their relatives from bringing food into the Hospital for consumption on the premises. The Hospital follows a no-smoking policy, so, smoking is not permitted inside the hospital building. Occasionally fire alarm bells will sound during the course of testing or as the result of sensitive smoke detection equipment. You will be advised immediately if any action is necessary. Alarm bells will not be switched off until authorization is received from the Fire Brigade. 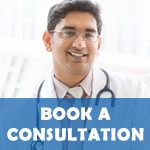 Patients are discharged as per the advice of the treating consultants. Patients are generally discharged between 10.30 am and 12 noon. Patient relatives are requested to carry all the necessary documents such as medicine bills, advance payment receipts and patient's clothing. The final bills should be settled at the Accounts Department on the day of discharge. Corporate patients are discharged after the completion of the necessary formalities as applicable. For the patients who are admitted under the coverage of any medical insurance, their relatives are requested to contact the medical insurance department prior to their date of discharge for the necessary discharge formalities. Special permission should be acquired from the Medical Administration in case of discharge beyond the regular discharge timings or against the advice of the treating consultant. Such discharges may take about 3-4 hours for the completion of the necessary formalities. During the course of discharge you will be provided with the discharge summary containing the clinical summary of your treatment and the advice on discharge, all the investigation reports (available till then). Ruby General Hospital wants you to receive quality care. As a patient at the hospital, it is important to realize that you have both rights and responsibilities. This summary of patients' rights and responsibilities given below describe how you can participate in receiving quality care. Our Doctors, Nurses and other staff are committed to provide best care. Please feel free to discuss this with your doctor or the Sister In Charge of your Ward. You may also contact Floor PRO, Senior Manager - Operations & B.D. or Manager Growth & Development at the following numbers: 033- 39871800 / 9831358000/ 9748496690. To have information regarding your medical treatment explained to your family member or other appropriate individual when you are unable to participate in decisions about your care. To be advised of hospital policies,procedures, rules and regulations that may affect your care. To be aware that the hospital's bioethics committee is available to you to discuss ethical issues related to your care. To know the names/titles of your caregivers. To review your bill and to have any questions or concerns you have, adequately addressed. To ask your care givers for more information if you do not understand your illness or treatment.